Of all of the Christmas traditions you know and love, one of the most beloved is seeing and hearing The Nutcracker. In West Michigan, what you see is Grand Rapids Ballet dance its version of the story of Clara and her magical Nutcracker Doll. What you hear is the Grand Rapids Symphony performing Peter Ilyich Tchaikovsky’s magical score. “When done right, it’s magic,” said GRS Associate Conductor John Varineau, who for many years has conducted the Grand Rapids Symphony in Grand Rapids Ballet’s annual production of the holiday favorite. The enduring Christmas tradition opens Friday, Dec. 1 for eight performances over two weekends through Sunday, Dec. 10, in DeVos Performance Hall. Three years ago, Grand Rapids Ballet unveiled a new production of The Nutcracker, co-designed by illustrator and Grand Rapids native Chris Van Allsburg, author of The Polar Express, and by Eugene Lee, a Tony Award-winning set designer, who has designed for such shows as Sweeney Todd, The Lion King and Wicked. Val Caniparoli, one of America’s leading choreographers, who has worked with Joffrey Ballet, Pacific Northwest Ballet, Boston Ballet, and Lyric Opera of Chicago, choreographed the ballet hat debuted in December 2014. Grand Rapids Ballet Artistic Director Patricia Barker designed costumes for the production that sold out several shows during its premiere season. Some 21,000 saw the debut of Grand Rapids Ballet's first new production of The Nutcracker in three decades. Premiered in 1892 in St. Petersburg, Russia, The Nutcracker was not an immediate hit. One reason may have been because its premiere was part of a double bill with Tchaikovsky’s final opera, Iolanta, which was performed first followed by the ballet. The company’s prima ballerina, Antonietta Dell’era, didn’t appear on stage until the end of the Second Act, and the performance didn’t end until just past midnight. For many years, Tchaikovsky’s “The Nutcracker Suite” was far more popular than the ballet itself. Tchaikovsky himself, who died less than a year after its debut, didn’t think it was his best work, believing his Sleeping Beauty Ballet was better. The Nutcracker was seldom performed in Europe for decades. But in the 1950s, another Russian, choreographer George Balanchine, brought it to the United States, creating a version for New York City Ballet that debuted in 1954. Though its original story, The Nutcracker and the Mouse King was written by E.T.A. Hoffmann, a German, and its music was composed by a Russian and choreographed by a Frenchman and his Russian assistant, it was American audiences that made The Nutcracker a holiday tradition. 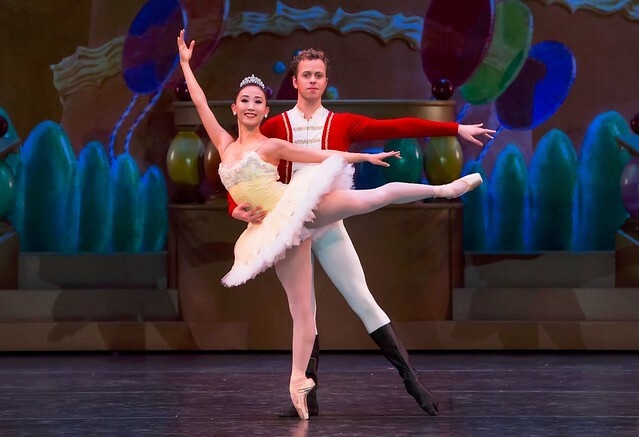 Grand Rapids Ballet’s production, featuring the Grand Rapids Symphony, will be held at 7:30 p.m. Friday and Saturday, Dec. 1-2, with matinees at 2 p.m. Saturday and Sunday, Dec. 2-3. Performances continue next week at 7:30 p.m. Friday and Saturday, Dec. 8-9, with matinees at 2 p.m. Saturday and Sunday, Dec. 9-10. Tickets start at $20. Call Grand Rapids Ballet at (616) 454-4771 or go online to grballet.com/nutcracker. Caniparoli, who has served as a principal character dancer with San Francisco Ballet, returned to Grand Rapids in November to prepare for December’s performances. “He continues to finesse and develop the strength of the work, especially as the dancers' talents evolve and emerge,” Barker said. Choreographers typically revise their work, sometimes for particular dancers, but also because the passing of time gives them new insight into their earlier work. Caniparoli hopes fans discover something new in this year's production.